This stone is also called the Tree Agate because of the patterns it can show due to inclusions in the stone. Its name comes from the Greek language "Dendron" meaning tree. 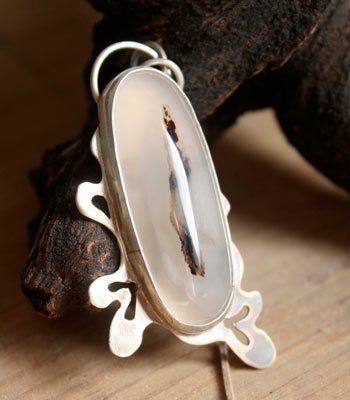 It is a chalcedony with iron and manganese inclusions which can create fern, branches or fossilized tree designs. It is often a transparent stone, or with a light green or brown color. It is quite difficult to cut because you have to find the nicest veins in the stone to show the patterns. Some objects from the Neolithic period were made with this stone. 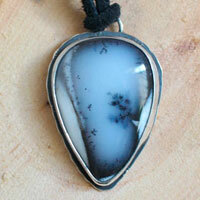 In the Antiquity, Greek people would use the dendritic agate to get better harvests. 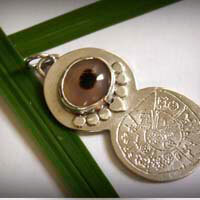 It was also used as a talisman to have prosperity. They would associate it with forest nymphs called dryads. It was common to bury stones in the fields before sowing to have good crops. 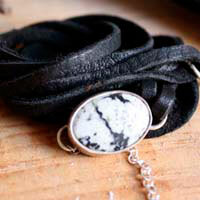 They would also associate the dendritic agate with the hunting goddess, Artemis. It symbolizes the forest, the place where she dwells. 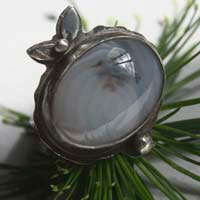 The dendritic agate was also associated to the Roman goddess Flora, the plant goddess. In Russia, people like this stone a lot because it is the symbol of a long, healthy and prosperous life. The silversmith of the Imperial Court, Carl Fabergé (from 1885 to 1916) would often include this stone in his creations, among other precious stones. Mines: Brazil, India, the USA, the Czech Republic, Iceland and Morocco. It would cure diseases due to imbalances. Like the pattern it shows, it would cure anything related to the branching body like veins or the nervous system. 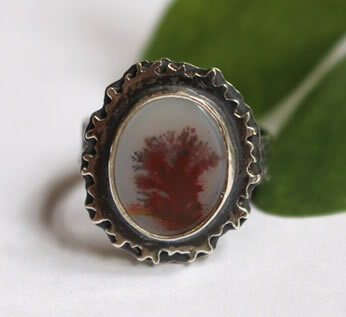 The dendritic agate would help to avoid hair degeneration and would stimulate the blood system. It would relieve pains but would be slow in doing so. 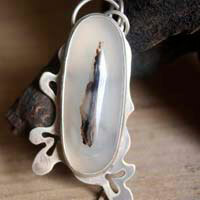 The dendritic agate has a special link with the vegetal kingdom and would improve the relation between man and nature. It would help to realign the back spin.